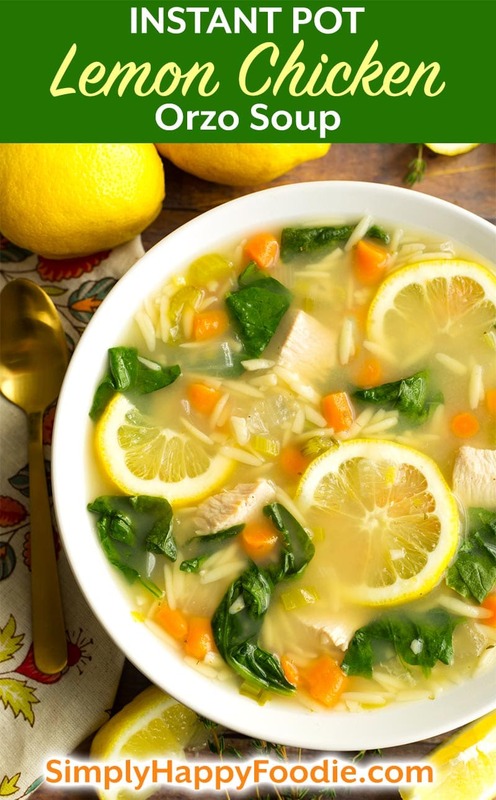 Instant Pot Lemon Chicken Orzo Soup is a light and delicious soup that you can make in minutes. 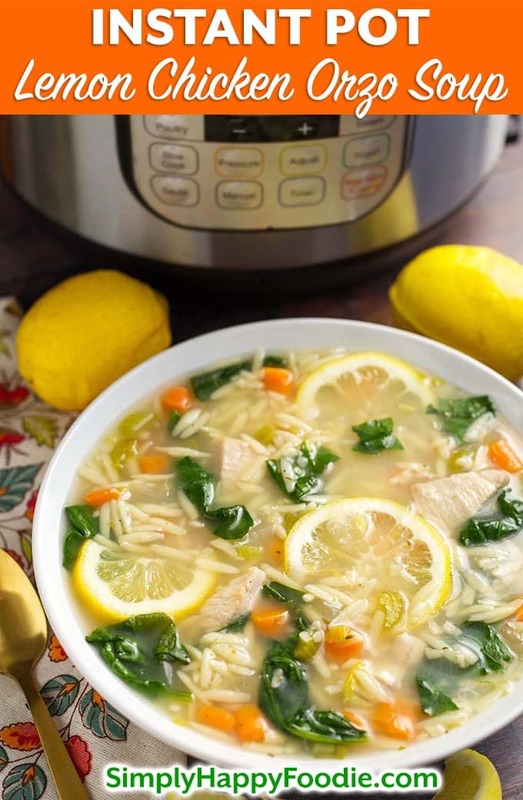 This pressure cooker lemon chicken orzo soup is healthy and tasty, with simple ingredients, and is an easy Instant Pot chicken soup to make. The Fall season means the kids are back in school, and people more often together in close quarters. There is a greater chance of catching a cold, or some other bug. Other than my Instant Pot Elderberry Syrup recipe, I like to have a simple chicken soup recipe on hand that I can make easily and quickly if one of us is under the weather. One that doesn’t come from a can. Fall is also the time when more people think about eating soups. If you know me at all, you know that I am crazy about soup, and that Instant Pot® soups are my favorite! 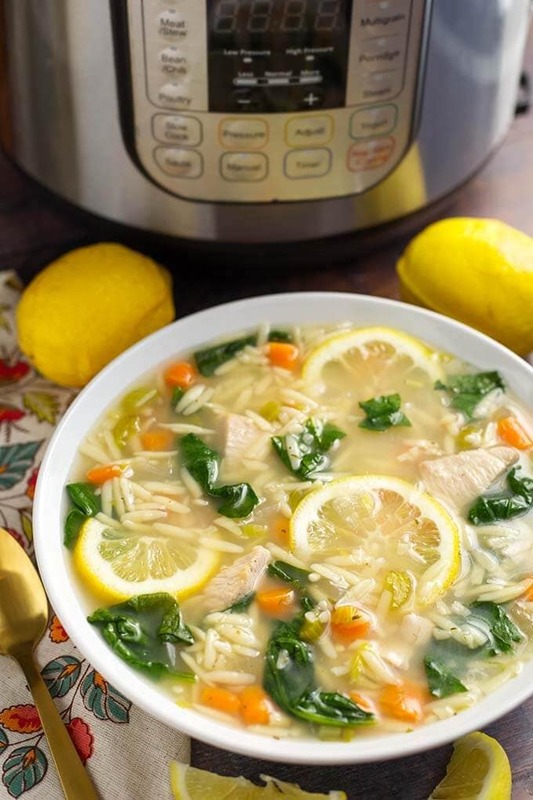 Instant Pot Lemon Chicken Orzo Soup is best made with skinless/boneless chicken thighs, as they are more juicy and tender than skinless/boneless chicken breasts. Either way you make this soup, it will be delicious! 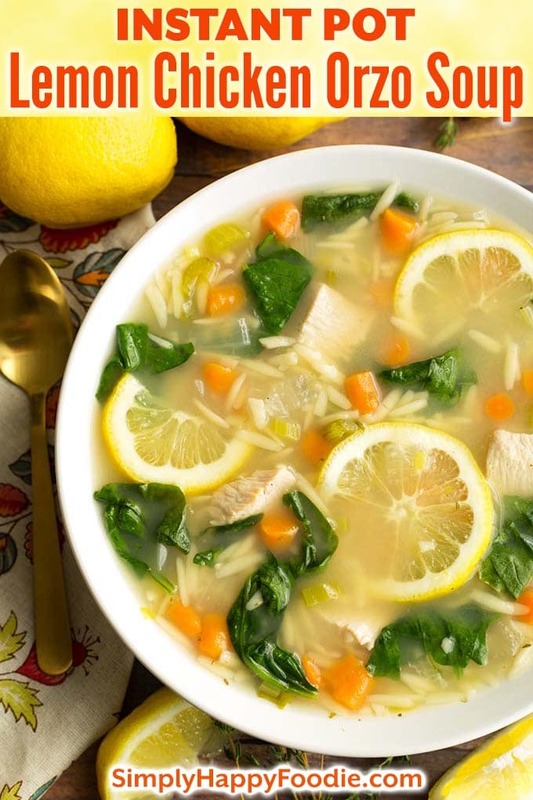 If you are making Instant Pot Lemon Chicken Orzo Soup with breast meat, cut the pieces a little larger than bite-sized, and that will help them not be too dry. The short cook time helps with that as well. Orzo pasta comes in whole wheat as well as the regular kind, so if you want a whole grain option, look for that. Orzo is really economical, too. I can often find a 1 lb box of name brand orzo for 99 cents! 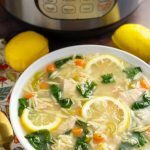 Instant Pot Lemon Chicken Orzo Soup is a light and delicious soup that you can make in minutes. 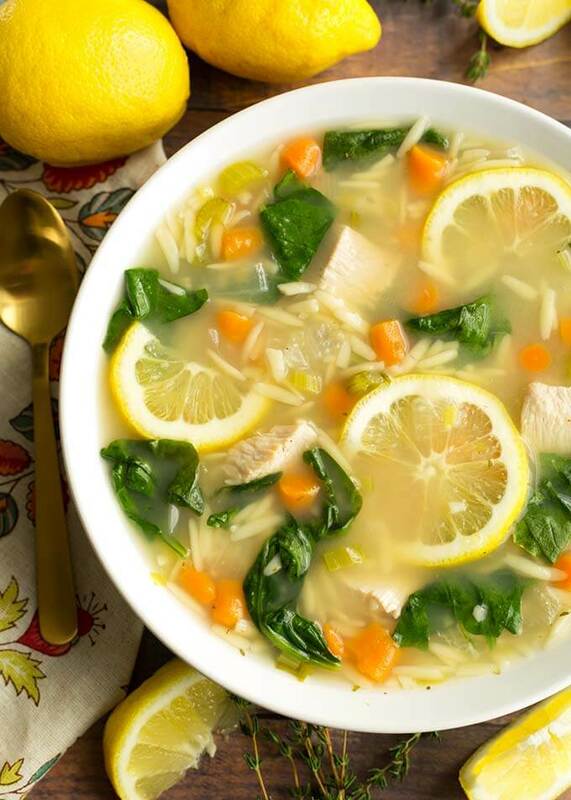 This pressure cooker lemon chicken orzo soup is healthy, with simple ingredients, and is an easy Instant Pot chicken soup. Have all of your ingredients prepped before starting to cook the soup. Veggies chopped, etc. Turn pot on to the sauté setting. When the pot is hot add the olive oil. Then add the onions and cook, stirring occasionally, until turning translucent. Add the celery, carrots, and garlic and cook, stirring constantly, for about 20 seconds. Add the chicken, rosemary, salt & pepper. Stir. Add the broth, lemon zest, and orzo pasta. Stir. Place the lid on and set the steam release knob to the Sealing position. Press the Pressure Cook or Manual button or dial, then the +/- button or dial to select 3 minutes. When the cook time is finished, do a *Controlled Quick Release of the steam/pressure. *A controlled quick release means you release the steam in short bursts, then longer bursts, until you can be sure none of the sauce spews out of the vent with the steam from the intense pressure. Then fully open the vent and let it go. When the pin in the lid drops down, open it and add half of the lemon juice and the spinach leaves. Taste and adjust salt, if needed, and add the remaining lemon juice if you want. I tell people to use half in case they think it's too lemony. I like the full amount, but you may not. Or you may like more! Serve hot with some bread, lemon wedges, parmesan, or whatever you like. Hi! I made this last night and it was delicious! Just curious, did you precook your chicken? Or did you put it in uncooked? Hi Lacey, I did not precook it. I also had this question, so 3 minutes is enough time to cook the chicken through? Yes, as long as it is cut into slightly larger than bite-sized pieces. Pressure cooking time is determined by a few factors, one of which is the size of the food. I’m going to try this recipe for an office function and I need to feed a lot of people. Can the recipe be doubled?and will it still fit in an 8 qt Instant Pot? Yes, it should be fine in an 8 qt. Just be cautious on the pressure release. I normally don’t leave reviews but I had to on this delish soup. The only thing I did differently was I used better than bouillon instead of broth and added more lemon cause you know lemon.. Yummy cannot even begin to describe this bowl of deliciousness. Thank you for a keeper.. Thank you, Stephanie! I’m very happy that you liked this soup recipe! Thank you for taking the time to leave a review! Hi – I just made your soup & I am wondering about 2 things…the first is that my chicken still appears to be slightly pink after I cooked it according to your directions of 3 minutes. I cut the pieces quite small and I even added 1 minute to the cooking time since I was doubling the recipe. Also, my orzo looks like it disintegrated when cooking. Just curious, could you add the orzo after cooking, when you add the lemon juice and spinach? Since the soup will still be quite hot, wouldn’t the orzo cook naturally in the hot liquid without subjecting it to the “pressurized” cooking? Hi Jen. If your chicken was cut to the slightly larger than bite size pieces, and you cooked at the written time, I don’t see how it would not be cooked through. I would use an instant read thermometer just to be sure! If you cook the orzo at the written time it shouldn’t dissolve, so the extra time you gave it is the culprit. You can add the orzo at the end and use the sauté setting if you want to and that will work. I am making the soup right now not sure on the Rosemary do I put the spring in whole or do I pull off the needles and chop them up small? I toss the sprig in whole. Hi, I haven’t tried it, or any other soups in the new toy, yet, but it looks like a really good recipe. We’ve always had it with rice instead of Orzo. How much rice should i use to replace the pasta and would anything change in the preparation? Thanks!